Questions about compressor motor issues and how to deal with compressor motor problems, are cropping up more and more from the ASK page of late. I am a bit specialized in my knowledge of compressed air, I guess, in that I have worked on compressor pneumatic circuitry for years, along with specifying air valves, cylinders etc. Now I get asked more and more about compressor motor issues, and I am not the guy that has all the answers, for sure. I don’t fix electric motors myself, and I am not an electrician. Lots of other air compressor owners do have experience in dealing with compressor motor issues and electricity though, and so I have put this forum page up and invite folks with questions to post them, and folks with answers to provide advice. If you have a compressor motor problem that isn’t already discussed in this forum, please use the form below to add your question. If you read about a question that you can answer, comment on that posting if you would. I will help where I can. I would appreciate some help from you too. 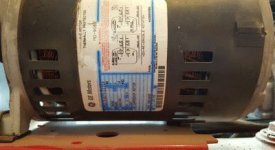 New Compressor Motor Issues – Please add your comment here along with photos to help others help you with your compressor and equipment problem!